Fifa has defended its decision to scrap an anti-racism taskforce, with critics branding the move "shameful". The Fifa Taskforce Against Racism and Discrimination was set up in 2013 to develop strategies to tackle the issue. 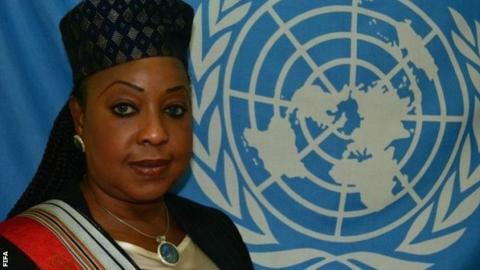 Fifa secretary general Fatma Samba Diouf Samoura said: "It had a specific mandate, which it has fully fulfilled." But former Fifa vice-president Prince Ali bin al-Hussein said: "For it to be disbanded with Fifa considering its work done is extremely worrying." Prince Ali, the president of the Jordan Football Association and a former Fifa presidential candidate, added: "The notion the current Fifa leadership believe the taskforce's recommendations have been implemented is shameful." Anti-discrimination group Kick it Out was initially "perplexed" by the decision but said it was "reassured" after holding talks with Fifa later in the day. But Hope not Hate chief executive Nick Lowles told the BBC the decision to wind up the taskforce sent out "a really bad signal" and questioned what world football's governing body planned to do to tackle racism in the future. Former taskforce member Osasu Obayiuwana said there "remained a lot of very serious work for the taskforce to have done". Speaking at the Soccerex global football conference in Manchester on Monday, Samoura said the taskforce's recommendations had been turned into a "strong programme" to tackle racism. She added: "My presence here is a demonstration that Fifa has a zero-tolerance policy against discrimination, not only racism but any kind of discrimination, including violation of human rights." What are the taskforce's recommendations? The anti-racism taskforce was established by former Fifa president Sepp Blatter and headed by Jeffrey Webb until he was arrested in 2015 as part of an investigation into corruption. Its recommendations included introducing extra observers at games and tough penalties for clubs whose players, officials or fans are guilty of racism. Earlier this month, European football's governing body Uefa ordered Russian club FC Rostov to close a section of their stadium for a Champions League game against PSV Eindhoven as punishment for racist behaviour of their fans. Uefa said fans in Rostov-on-Don, one of the host cities for the 2018 Fifa World Cup, were guilty of unspecified offences during their play-off victory against Dutch side Ajax on 24 August. Fifa's anti-discrimination taskforce was set up on a temporary basis and a number of its recommendations have been put into action. In May 2015, Fifa introduced an Anti-Discrimination Monitoring System which will assess 850 high-risk matches for potential discriminatory incidents during the 2018 World Cup qualifiers and friendlies. So some progress has clearly been made. Nevertheless, the dismantling of the taskforce has been both poorly handled and communicated. The way the story emerged, first reported by the Associated Press, put Fifa on the back foot and allowed it to be perceived as being weak on the issue. Fifa insists it maintains a "zero-tolerance" attitude to discrimination within the game. But it must now prove that is the case through both actions and words.